Chronic kidney disease is a condition affecting close to 20 million Americans. Kidney specialists (nephrologists) suggest that changing your diet can help protect your kidneys. Diet can also help control other health conditions, such as diabetes and high blood pressure, which in fact can lead to kidney problems. If you suffer from kidney disease, paying close attention to what you eat and drink could help you stay healthier. Renal dieticians can help design a specific chronic kidney disease diet plan, but there are some basic guidelines that people with the disease should know about. It’s important for those with chronic kidney disease to maintain a healthy weight and eat a well-balanced diet that is low in salt and fat. A chronic kidney disease diet menu limits certain foods to prevent minerals that could cause further damage from building up in your body. No matter what is on your chronic kidney disease diet food list, you need to keep track of your nutrient intake. For example, monitor the calories, protein, fat, and carbohydrates. “Nutrition Facts” labels are the quickest and easiest guideline to follow. 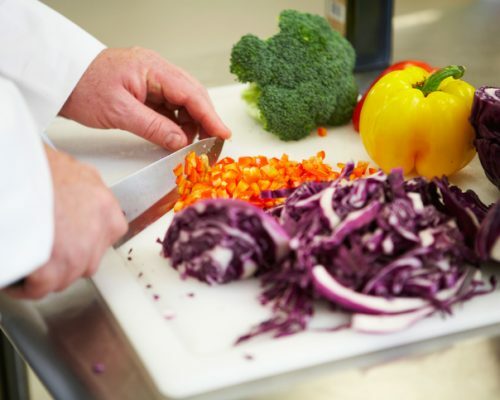 Making good food choices will allow you to have energy to perform daily tasks, prevent infection, build muscle, maintain a healthy weight, and keep your kidney disease from worsening. Common sense should rule when eating. For example, you shouldn’t skip meals. If there are times when you just don’t feel hungry, at least try to eat four or five small meals instead of one or two big ones. There may be some people with kidney problems that have difficulty keeping their weight up. These individuals need to talk to their doctors and dieticians about the best ways to add calories to their diet. Anyone with chronic kidney disease should also talk to a physician before drinking any alcohol. Several studies have linked “super foods” to preventing and protecting against chronic diseases. Foods that contain antioxidants seem to neutralize free radicals and protect against oxidation, which is a process of energy production and chemical reactions that can lead to free radicals. It is believed that free radicals damage proteins and cell membranes. Based on the oxidation theory, kidney-friendly foods are the same foods that can reduce inflammation and lower the risk of cardiovascular disease. Red bell peppers – Low in potassium and full of vitamins C, A, B6, as well as folic acid and fiber. Cauliflower – High in vitamin C, a source of folate, a source of fiber, and full of compounds that could neutralize toxic substances in the body. Cabbage – Full of a compound that can break up free radicals. Garlic – Reduces inflammation and can lower cholesterol. Apples – High in fiber and anti-inflammatory compounds. Cranberries – Promote gastrointestinal health. Blueberries – High in antioxidants and manganese, which promotes bone health. Cherries – Contain anti-inflammatory compounds. Egg whites – Pure protein with all the essential amino acids. For the chronic kidney disease diet, egg whites provide protein with less phosphorus. Fish – Provides high-quality protein and contains anti-inflammatory fats called omega-3s. There are specific chronic kidney disease diet recipes you can follow if you are concerned about maintaining a healthy routine. For example, dieticians often suggest smoothies to get just the right amount of nutrients. Some of these smoothies are hearty enough to be as filling as a full meal. The blueberry smoothie below is an example. Place blueberries in a blender and blend on low for a minute. Add protein powder, yogurt, and almond milk. Blend to a soft-serve consistency, scoop into a bowl, and top with sliced strawberries, raspberries, high-fiber cereal, or coconut flakes. Balancing protein can be a challenge for some people with kidney problems, but there are also recipes designed to address this. One example of a healthy protein is the easy egg salad recipe below. Hard boil the eggs for 8 minutes. Turn the heat off and leave eggs in water for 2 additional minutes. Peel the eggs and chop or grate to desired consistency. Chop celery and onion or chop in a food processor until finely chopped. Place in a colander and add relish. Drain well to remove liquid. Shake colander to get as much liquid out as possible. In a medium bowl mix all ingredients together until well blended. Chill about an hour in the refrigerator before consuming. These are just a couple examples, but there are many different kidney-friendly recipes you can get from a qualified dietician. It is true that sometimes kidney disease can’t be avoided, but you can certainly take steps to reduce your risk of developing kidney problems. One way to take care of your kidney health is to avoid smoking. It can lead to heart attacks and strokes, which are associated with a higher risk of kidney issues. You already know how important diet is, but so is exercise. Regular exercise can keep your blood pressure under control and help you maintain a healthy weight, which can reduce the risk of kidney disease. Kidney disease specialists also suggest that you limit alcohol to no more than 14 units per week. This is the equivalent of six pints of beer or 10 small glasses of wine. This is just a general guideline – remember those with underlying health conditions may need to have a stricter alcohol limit. Sadly, many people don’t realize that kidney disease can be caused by medications. Taking too many non-steroidal anti-inflammatories, including those that are available over the counter, can cause kidney disease. Taking medications longer than recommended can also lead to kidney problems. Be sure to follow medication instructions carefully. Kidney disease only gets to the advanced stage in a small proportion of people, but it is important to know that the damage from chronic kidney disease can’t be repaired. The good news is, your condition won’t necessarily get worse if you take steps to enforce a healthy lifestyle that includes eating the right foods.